This is a sponsored post written by me on behalf of Oscar Mayer Bacon. All opinions are 100% mine. 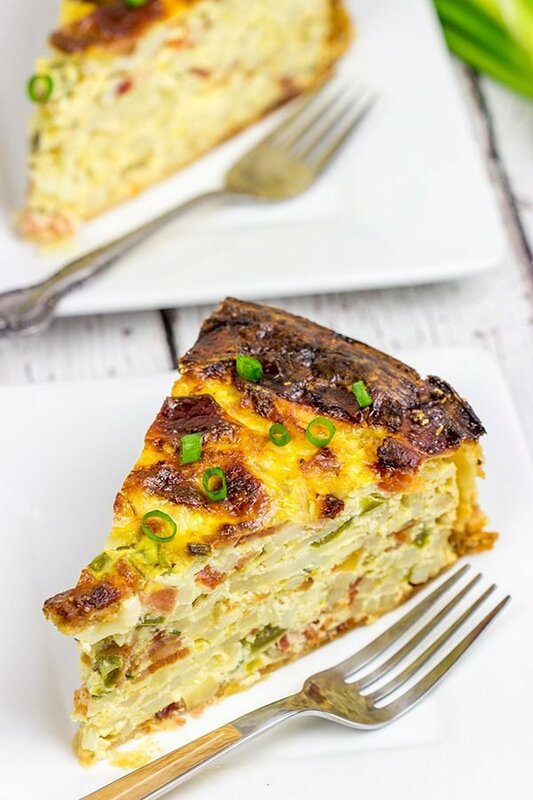 This Bacon and Egg Breakfast Casserole is perfect for weekend brunch! As delicious as bacon sounds sizzling in a skillet (and that sound makes my mouth water! ), I’ve actually started cooking bacon a different way. I like cooking bacon in the oven now. I know, I know. It almost feels like blasphemy to not cook bacon in a skillet, but hear me out. Cooking (baking?) bacon in the oven is really easy. And the cleanup is a cinch, too. Just line a baking sheet with foil, add bacon and bake at 400°F for 10-12 minutes. No need to turn the bacon, either! And for extra crispy bacon, just place a metal slotted tray on top of the baking pan. *boom* Perfect bacon. Every time. 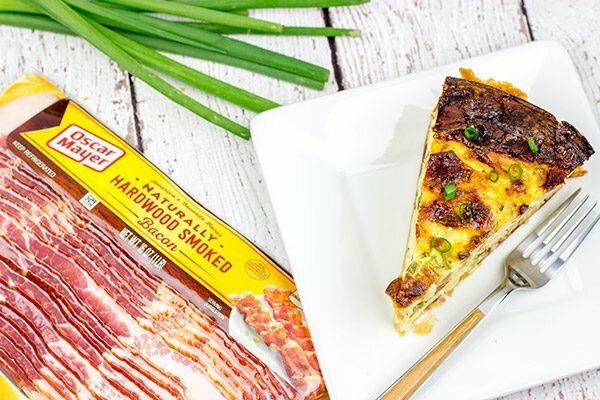 For this Bacon and Egg Breakfast Casserole, I used Oscar Mayer’s Naturally Hardwood Smoked Bacon. Not only is their bacon hand-trimmed, but it’s naturally naturally slow smoked with hardwoods for added flavor. If you’ve been reading this blog for a while, you know how much I love smoked flavors. So it’s a no-brainer for me to pick up hardwood smoked bacon when I’m standing in the bacon section at the grocery store. Oscar Mayer makes several different varieties of bacon, and truthfully I had a hard time deciding which to use for this Bacon and Egg Breakfast Casserole. They all sounded so good. I went with the Naturally Hardwood Smoked Bacon for this recipe, and it worked out well! When my sister and I were young, we’d often head up to my grandparents’ house in upstate South Carolina for Spring Break every year. It was only a short 4-hour drive from Charleston, although I still made sure to pack enough car activities to keep me entertained for days. One of my favorite activities? Getting out a big map of South Carolina and actually following our path with my finger as we drove north. I’d anticipate the turns and how long til the next exit. I was a weird kid. Fast forward to mornings at Grandma’s house. My grandparents had a huge backyard complete with a barn, a chicken coop, a pool and tons of magnolia trees that were perfect for climbing. To prepare for a day of exploring, we always started with a delicious breakfast! One of my favorites was Grandma’s hash brown casserole. This casserole was filled with chopped potatoes, eggs and bacon…and it was delicious! I’m surprised I don’t have a photo somewhere of 8-year-old me chowing down on a slice of that casserole. One quick baking note: this Bacon and Egg Breakfast Casserole takes a bit of time to bake, but the prep work is quick and easy! I suggest mixing it up the day before and refrigerating it overnight. Then just pour it into the pan the next morning when you wake up and let it bake while you’re off planning your backyard adventures for the day. The timing should work out well! 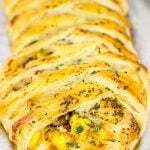 You could also just bake this one in a traditional casserole dish and reduce the baking time…although I kinda like the way the pie slices look here, don’t you? 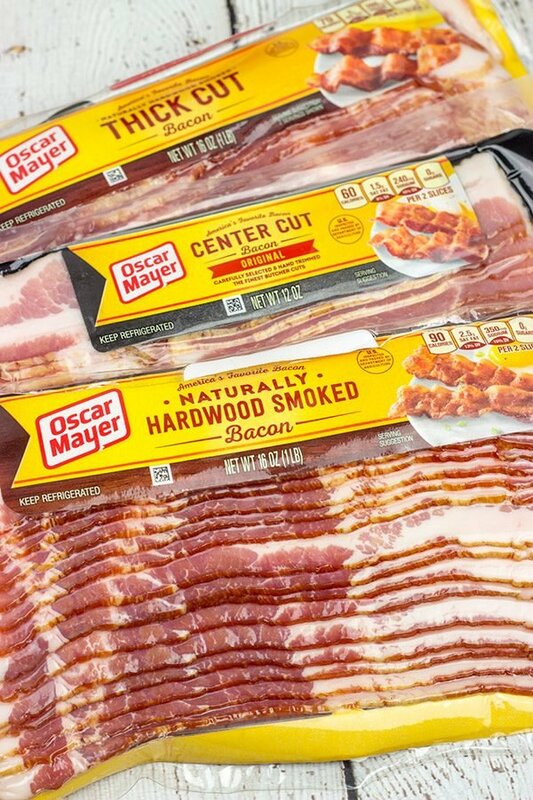 So as we head into Spring, grab a couple packs of Oscar Mayer’s Naturally Hardwood Smoked Bacon at the store. You’ll only need one pack for this Bacon and Egg Breakfast Casserole, but you can’t ever have too much bacon! Cheers, friends! Spray bottom and sides of a 9”x3” springform pan with cooking spray. Roll pie dough out into a 14” circle. Press dough into bottom and sides of prepared pan; set pan aside. Line 2 jellyroll baking pans with foil. Lay bacon in a single layer on pans and then bake at 400°F for 10-12 minutes, or until fully cooked. Transfer bacon to a paper-towel lined plate; pat dry. Crumble bacon and set aside. Using a large mixing bowl, whisk together eggs, milk, salt and pepper. Add remaining ingredients (onion, bell pepper, tomato, green onions, cheeses and hash browns) along with half of the crumbled bacon; stir until well combined. Pour mixture into prepared springform pan. Sprinkle remaining half of crumbled bacon on top. Let cool in pan for 10 minutes. Before releasing springform pan, run a table knife around the inside edge of the pan to loosen crust. This casserole takes a bit of time to bake as it is rather deep. I recommend making the filling the day before and then pouring it into the pan and baking it as soon as you wake up. Alternatively, to shorten the baking time, simply bake this in a standard 9"x13" casserole dish instead. Breakfast is my favorite! I’d gladly eat it for three meals a day. But maps on a road trip? No. I’ve never liked reading maps! All those lines confuse me. For me, road trips growing up were an excuse to read a big stack of Nancy Drew books. Love your tip about cooking bacon. Anything to make cleanup easier! Me, too! Breakfast food is so good. I could literally eat breakfast 3x a day and be quite happy about it. 🙂 But maps. Seriously? I think we finally found somewhere that we differ! I loved the concept of being able to find exactly where we were on the map…and then using that to figure out how much longer until we got to Grandma’s! But we’re back on course with Nancy Drew. Hardy Boys for me, but same concept. Thanks, Kelsie!! This looks delicious. I can’t wait to try it. Question: could I substitute left-over cooked hash browns? I frequently make them from actual potatoes and often have left-overs. Love your recipes! Hey Joan! You could absolutely, 100% use leftover hash browns. We occasionally make hash browns on the weekends here, too…so good! So, yes, just stash ~3-4 cups of hash browns aside next time you make ’em. 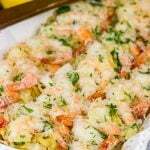 (Or you could just put those leftover hash browns in the freezer so that you have them on hand for this recipe, too.) I appreciate your comment, my friend! 🙂 Hope your week is going well so far! David – this looks amazing! 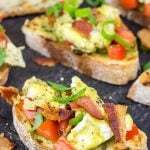 I’m always looking for something savory and interesting for brunches, and this fits the bill perfectly! Thanks for the recipe! I’m right there with ya, Laura! My mind always goes to sweets when it comes time for brunch (mmm…blueberry muffins and cinnamon rolls! ), but savory needs a place at the table, too. This recipe is really tasty, too! Thanks so much, my friend! This is an impressive dish!! I’m all over the thick cut bacon and I too always bake it. It comes out so perfectly browned and crisp. Yes! I didn’t realize so many folks baked their bacon. It’s such an easy way to cook bacon…and it’s low maintenance, so I can be working on other things while that bacon is in the oven. Yum…bacon! Thanks so much, Shelby!! Memories of the times spent with our grandparents are the best: so full of free spirit, aren’t they ? So is the food ! 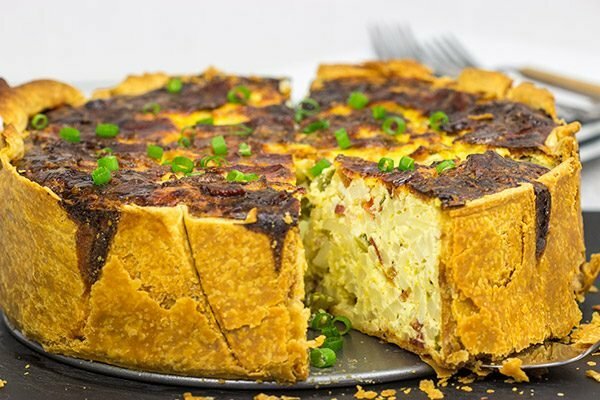 Love the crust, bacon ….. everything ! Thank you ! Oh, those memories of times spent with grandparents really are hard to beat. I’d give anything to go back and relive a day or two running around their yard in the summer. 🙂 Thanks so much for the kind words, my friend! Cheers! Grandma’s breakfast casserole looks amazing! I love how tall it is. It would satisfy even the hungriest of eaters. There’s nothing better than bacon….and I just happen to have a bunch on hand! 🙂 I think I need to try your oven method for cooking the bacon and then this casserole! I agree, Kathy! The height of this casserole makes it really fun to serve. (It also means it takes a while to bake, but that’s ok since you can just mix up the ‘batter’ the day before.) Grandma knew how to cook…that’s for sure! And, yes, you do just happen to have some bacon on hand. Hahaha! 🙂 Definitely try cooking that bacon in the oven next time…it’s a pretty cool trick. Just put the bacon on a wire rack (over a sheet pan) to get it nice and crispy. Mmmm…crispy bacon! My father in law likes bacon, so will recommend him this recipe — thanks! Yes! Breakfast is my most favourite meal of the day. Although we’re up and out of the house early during the week for work, so it’s mostly just porridge on a weekday, I always make sure that at the weekend we have something different and a bit more substantial like Burritos or a Frittata. This bacon and egg breakfast casserole is right up that street too. Oh and nothing wrong with tracing your finger along your path on a map BTW, I’d still do that if Lynne was able to drive. Ha ha ha! I agree that weekday mornings are a bit of routine so that we can get to work on time…but weekends? That’s a different story! We whipped up this casserole recently, and it was incredible. And it was especially fun for me as it carries good memories of growing up watching my grandmother cook for us. As far as the map goes, I suspect you’ll be doing some finger tracing of your own next week! 🙂 Thanks, Neil! I am a big fan when it comes to breakfast. This bacon and egg casserole would be a great way to start my day. Sounds yummy! We never skip breakfast around here! Especially when it’s rich and delicious like this casserole – honestly the kind of thing I’d happily eat for any meal of the day. I hear ya, Marissa! Breakfast really is my favorite meal of the day. And this casserole is really, really tasty, too. It reminds me of the one my Grandma used to make way back when I was a wee little lad. 🙂 Thanks, my friend! I could eat this for breakfast, lunch, or dinner. Does it reheat well? It does indeed reheat well, Jeff! I made this one when Laura was out of town for work, and I totally ate it for lunch and dinner for a couple of days. It was an easy meal to reheat after Robbie went to bed. I love baking bacon too – the clean up is so so much easier and I like to fool myself into thinking it’s better for me that way! 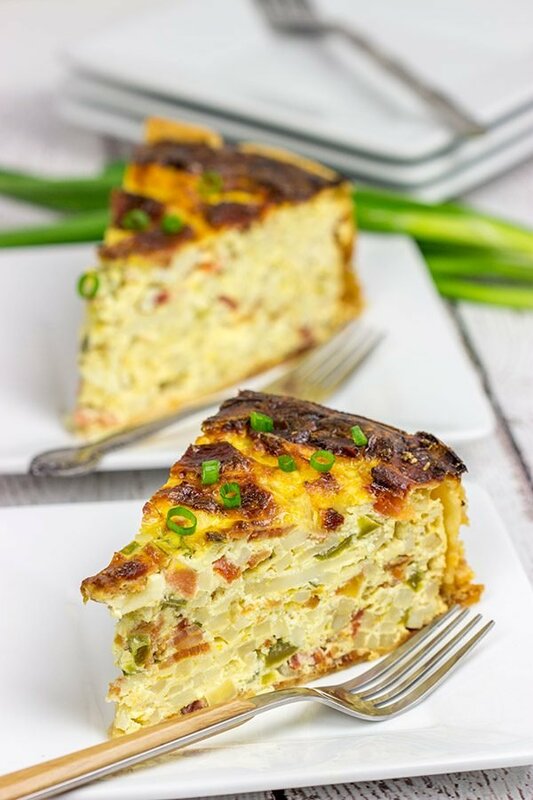 Now – back to this deep dish breakfast casserole – WOA – I thought that Charleston coconut cake was tall – DUDE – this is one of the tallest casseroles I’ve seen – which is great because one piece is so much more – right?! Also love that this can be made the night before and then tossed in the oven – fantastic recipe, my friend! Baking is the way to go with bacon, Shashi! I totally agree with you. I mean the sizzle in the pan is hard to leave out, but man is baking so much easier! So this casserole totally reminds me of the one my Grandma made back when I was a kid. And I loved every single slice of it! (Laura isn’t a huge fan of eggs, so I made this one while she was traveling for work…and then I ate it all up. Haha!) Thanks so much, my friend! Hey Sharon! 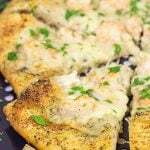 It’s a really tasty recipe…I hope you enjoy it as much as we do! As far as baking time in a 9×13″ dish, I honestly don’t know as I’ve never baked it in that size. I would start checking it early (say ~45 minutes) and then just keep baking until a toothpick or table knife inserted into center comes out clean. Just keep checking every ~10 minutes or so after the first 45.,.that might be erring on the side of too often, but better that than overbaking! Either way, happy baking! Oh, and will you swing back by and let me know how long it takes in that pan? Thanks! Well this just looks delicious! 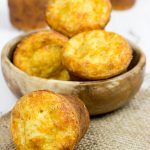 I wish I made more breakfast casseroles (and more breakfasts in general!) but this one in particular looks amazingly packed with goodness! Also there is absolutely no kitchen blasphemy in cooking bacon in the oven! It’s the BEST way to do it. So even and perfectly cooked..its awesome. What is blasphemy is if I just need one or two slices and in a serious time crunch I might just ehm….microwave it. Only if I crumble it though, I couldn’t eat that as is since it’s never evenly cooked enough. Either way, awesome recipe David! Thanks for sharing! 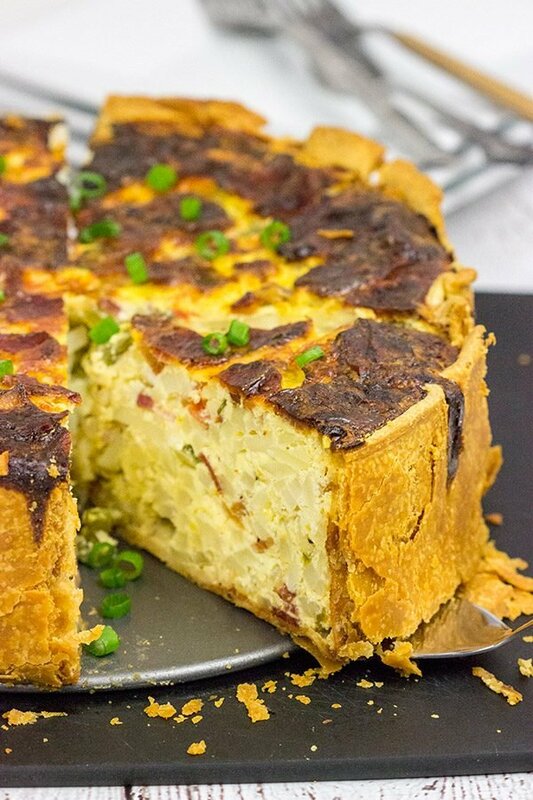 Oh, this casserole (or really, really tall quiche!) is packed with all sorts of deliciousness. That’s the wonderful thing about recipes like this…you’ve got a blank canvas to add whatever flavors you’d like! Now as far as microwaving bacon, I get it. I don’t blame you one bit. In fact, that’s how my Dad always made bacon growing up…and it’s still a great option in a pinch. I mean it’s bacon. 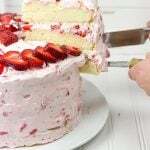 And sometimes you just need a slice (or two!) of bacon quickly! Thanks, Matt! Hey Irene! First of all, thank you so much for taking the time to hop over to this post itself. 🙂 I really do enjoy ‘chatting’ with readers…it’s one of my favorite ways to start each day! I do try to include some fun stories and thoughts in my posts…if nothing else, it makes the posts more fun for me to write, too! I mean the recipe is the main part, but the post itself can still be fun. I really hope you get a chance to try this recipe out. It’s a fun one, and it totally reminds me of growing up in my grandmother’s kitchen. Take note of the baking time (and tenting) here as this is a deep casserole…but the time is well worth it! Enjoy, and don’t be a stranger if you have thoughts/comments on other posts, too. I always respond to comments! Happy baking! This is just beautiful, David. 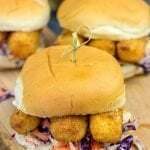 And totally mouthwatering! I would gladly eat / serve this for any meal of the day! Thank you so much, Marissa! I love breakfast food, too, and I could totally eat this any meal of the day. 🙂 Happy long weekend, my friend!